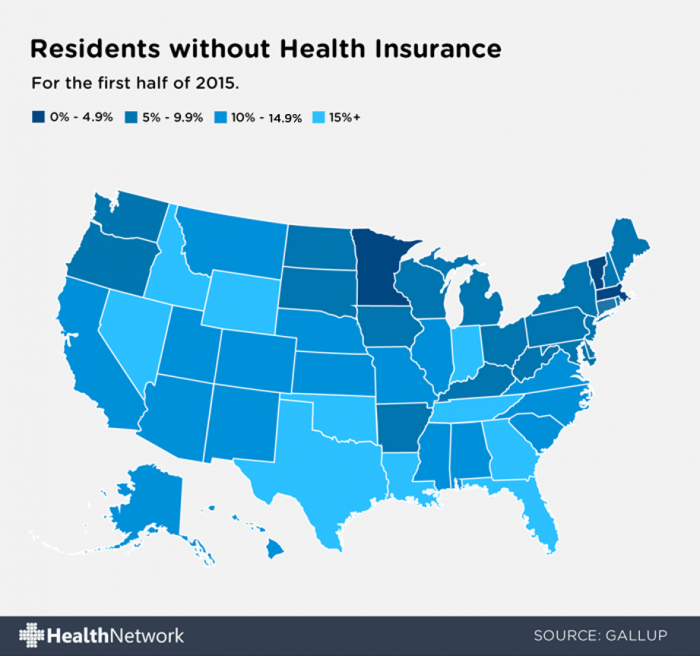 A recently released joint Gallup and Healthways poll shows that the rate of uninsured Americans continues to fall across the country. 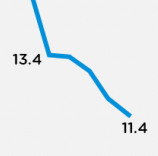 Just from 2016’s first quarter to the second – three months’ time — the uninsured rates for those 18 and over were shown to have fallen from 11.9 to 11.4 percent. Even more impressive, since 2013’s fourth quarter, this rate’s dropped by six percentage points. That last quarter of 2013 was the last measured period before the passing of the Affordable Care Act (ACA). And as the table below shows, this is actually the lowest recorded percentage since Gallup and Healthways began their daily tracking in 2008. The latest finding offers further evidence that the Affordable Care Act continues to exceed expectations for the entire nation and its healthcare system. For this poll, part of the larger Gallup-Healthways Well-Being Index, the two firms interviewed about 44,000 U.S. adults in all 50 states and the District of Columbia, from April 1 to June 30, 2015. Each day, they questioned 500 U.S. adults about their health insurance coverage (if any). Generally, the findings showed that the uninsured rates declined late in the first quarter, after the Feb. 15 deadline to purchase health insurance; the rate held steady throughout the second quarter. For 18-64-year-old with fully paid plans, either by themselves or a family member, 20.9 percent were covered in the second quarter, compared to 17.6 percent in 2013’s fourth quarter. 4 percent of 18-64-year-old s have health insurance through a current or former employer. This rate has remained relatively stable since 2013’s fourth quarter. For 18-64-year-old with Medicaid, 9.5 percent of 18- to 64-year-olds had coverage last quarter, compared to 6.9 percent in 2013’s final quarter. This is likely due to the ACA’s Medicaid expansion. Indeed, the expansion of Medicaid, the health insurance program for lower-income beneficiaries, seems to have played a big role on these lower uninsured rates. Another Gallup poll (see table below) found that for the first half of 2015, those 22 states supporting Obamacare and the Medicaid expansion showed that the uninsured rate fell 7.1 points. However, in those 28 states that implemented one or neither of these health programs, the uninsured rate only fell by 5.3 points. 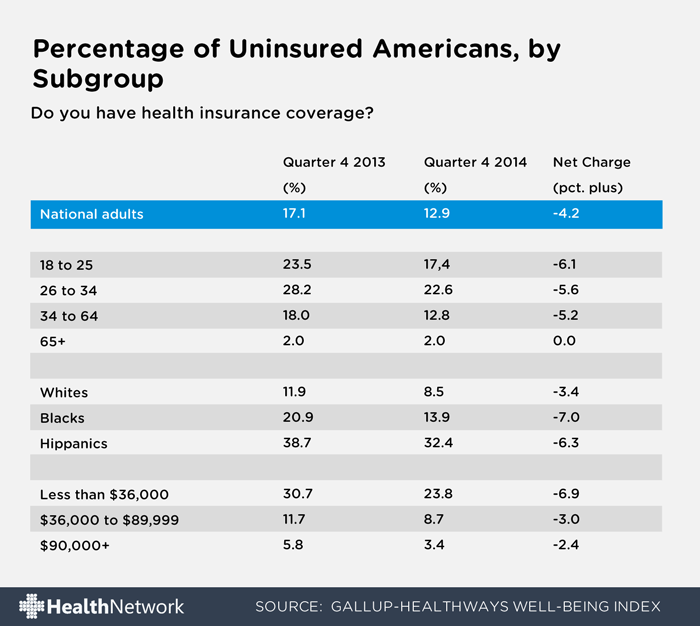 Nationwide, the uninsured rate in the first half of 2015 fell to 17.3 percent, compared to 17.3 percent for all of 2013. 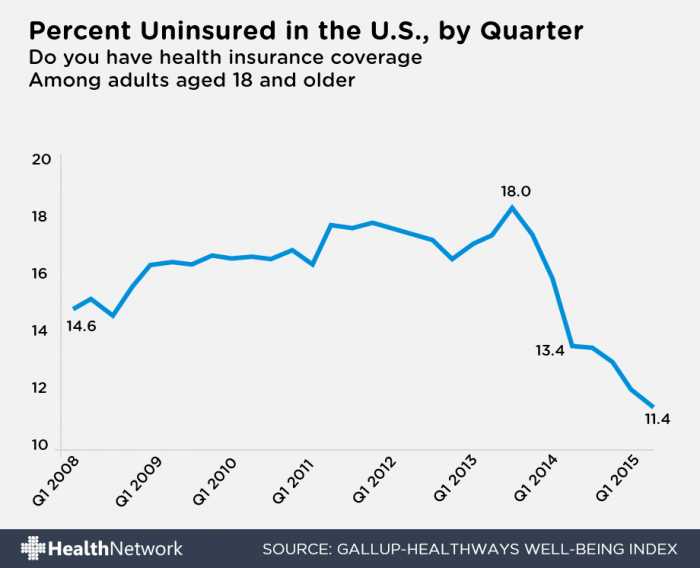 What do these lower uninsured rates mean? The Supreme Court’s recent decision in King vs. Burwell, ruling in favor of the ACA, means that millions of Americans will be able to afford and maintain their healthcare coverage. This decision also represents a major victory for the healthcare law itself. Had the Court ruled against the ACA, millions would have had to forgo their coverage. So, as proof of the Affordable Care Act’s positive impact on America, what better evidence could there be than the latest uninsured rate being the lowest since 2008? And with 2016 enrollment beginning on Nov. 1, 2015, the uninsured rates are expected to decline less than the previous year. A good number of Americans received some good news, as a change to Obamacare has removed the worry of rising premiums for 2016. Thanks to a new bill signed into action by President Obama, 3 million people will keep their current premiums’ costs next year. This is cause for celebration, but it’s only the most recent change to the healthcare law. The Congressional Research Service (CRS) found that since being passed in 2010, at least 14 similar bills have been signed into action involving the Affordable Care Act (ACA). Surprisingly, the CRS, which serves as a congressional think tank, said that this includes changes from both the Democrats and Republicans. This most recent bill, which was signed on Oct. 8, addresses a problem affecting 150,000 small businesses. The law’s original wording stated that for small businesses with less than 50 employees, there were special rules concerning coverage; this resulted in higher costs for employers. 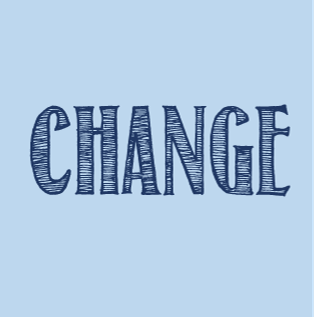 But starting in 2016, the change will instead be applied to small businesses of 51 to 100 employees. These small businesses will now have the ability to decide how to classify their businesses of 51-100 employees. As a result, these businesses may be spared paying higher premiums. Without this change, they may have faced increases of 18 percent or more. Additionally, with workers’ insurance premiums decreasing, their taxable income increases. Economists estimate that over the next decade, this could result in $280 million in additional revenues to the federal government. Those newly acquired funds would be used to support Medicaid. This newly signed bill represents millions in savings, but it’s only the latest in a long line. 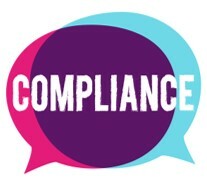 In 2011, an ACA provision was repealed that required businesses to report to the IRS whenever they made a purchase of more than $600 to a single vendor. Another involved the 2013 repeal of a voluntary, long-term care insurance plan, known as the Community Living Assistance Services and Supports (CLASS) Act. This law was designed with the intent of establishing a voluntary, long-term care insurance program to pay for community-based services and support for individuals with functional limitations. However, it was thought that this plan would attract those beneficiaries requiring large medical payouts. And ultimately, it was felt that the necessary premiums couldn’t be collected to cover all costs. 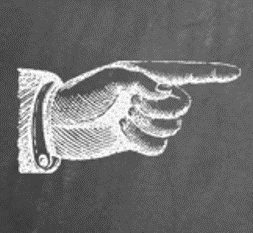 As such, the CLASS Act was repealed. Among the many benefits of the Affordable Care Act has been an impressive nationwide drop in unpaid medical bills. An International Business Times article illustrates that as more Americans sign up for healthcare coverage, hospital companies have seen their charity-related and unpaid (also known as uncompensated) expenses fall. These reductions are due to higher numbers of enrollees in both private plans and Medicaid, which provides health coverage for lower-income individuals and families. Bruce Japsen, a Forbes columnist, states that multiple hospital companies should be reporting these lower expenses in the coming weeks. These savings are expected to benefit the entire hospital industry, especially as more states expand their Medicaid coverage. 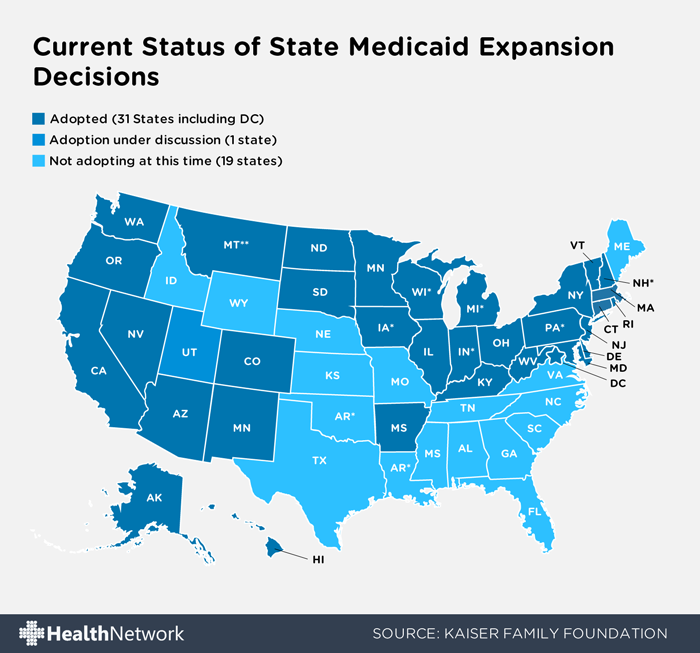 A Kaiser Family Foundation (KFF) study (below) shows that, under Obamacare, 31 states and the District of Columbia have accepted federal support to expand Medicaid programs over the last 18 months. As of the middle of 2016, the total for U.S. acute care hospitals’ charity care and uninsured discounts is $550 million. The first six months of 2014 saw $586 million spent; this represents a nearly 7 percent decrease. One good example of these financial benefits is Universal Health Services Inc., one of the nation’s largest hospital management companies. For the first half of 2014, the firm’s acute care hospitals’ expenses related to charity care, uninsured discounts and provision of “doubtful accounts” came out to $331 million. But for the first half of 2016, this amount dropped 17 percent, to $274 million. “Doubtful expenses” are those that aren’t expected to be paid back. In fact, Steve Filton, the company’s chief financial officer, said that the company’s uncompensated care costs have declined for the last six quarters. A good part of Universal’s recent savings is actually due to a larger number of Medicaid patients and the program’s expansion. That’s because the firm has acute care facilities in California, Nevada and the District of Columbia, all of which have expanded Medicaid. The Supreme Court case focused on whether those health insurance plans purchased through the government’s exchanges (the Health Insurance Marketplace) would still be eligible for tax credit subsidies. As it was written, the subsidies were only permitted for plans purchased through the Marketplace. The 16 states who ran their own exchanges wouldn’t have offered subsidies had the Court not ruled for the ACA. Without these subsidies, millions of people wouldn’t have been able to afford their monthly premiums and would have had to drop their coverage. But with the Court ruling in the law’s favor, potential and existing beneficiaries don’t have to the looming threat of their long-term coverage being taken away. With the Court’s final decision, it seems like clear sailing is the forecast for the healthcare law. But this higher approval rate is actually not a very common experience. Before and right after Obamacare’s passage, the average American didn’t really view the healthcare law too favorably. As of last year’s midterm elections, the ACA only had a 37 percent approval rating. However, its approval rate has increased by 10 percent between November 2014 and June 25, 2015. And even more impressive, this higher approval rate was generally seen with all demographic groups, including race, age and education level (see table below). 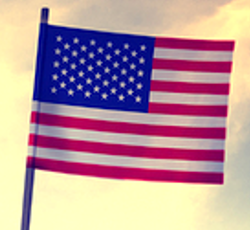 Even before the Court’s ruling, polling showed that the American public was taking a more favorable view of the law. But the overwhelming legal victory may have been just the thing to really improve the nation’s views of the ACA, as it now seems more legitimate and respectable. 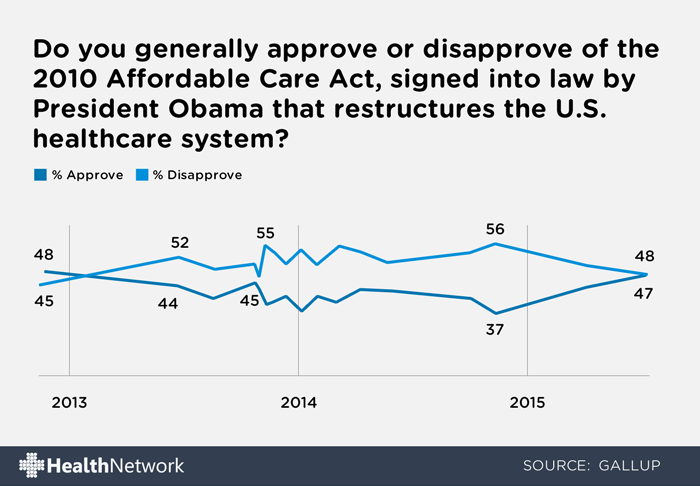 Another factor in Obamacare’s high approval rate may be the higher approval rate for the President himself. The latest Gallup poll shows that President Obama’s latest average quarterly approval rate is 46.4 percent, his best since mid-2013. And as many associate the ACA with the President (hence the Obamacare nickname), the healthcare law is feeling the benefits, as well. And even if faced with a future Republican-controlled Congress or a Republican president, experts believe that Obamacare will likely survive and thrive. That’s because the Republican majority would still have to overcome a potential Democratic filibuster if they tried to repeal or change parts of the law. For this survey, conducted July 1-3 and 5, 2015, Gallup interviewed 2,013 adults, aged 18 and older, living in all 50 U.S. states and the District of Columbia. The researchers took into account specific demographics, including gender, age, race, Hispanic ethnicity, education, region, population density and phone status (cell vs. landline). Traditional major medical policies offer “comprehensive coverage,” which includes preventive care, physicals, immunizations and possibly dental or vision care. But short-term health plans provide “catastrophic” coverage, such as for emergencies. These plans are effective for people who want coverage for catastrophes, but don’t want to give up other benefits for a lower premium. Basically, short-term policies provide real coverage for individuals in need of temporary health insurance coverage, generally between 30 days and 12 months, and are typically more affordable than traditional individual health coverage. Regardless of the reason for purchasing one, these plans are not a substitute for permanent coverage. But research suggests that the number of people applying for noncompliant, short-term health insurance policies increased by more than 100 percent in 2014. Individuals who missed the government’s open enrollment period purchased the majority of these plans. These customers now have to wait for the next open enrollment period, as they required an insurance plan to bridge the gap. Many people opt to purchase a short-term plan for financial reasons. Like traditional plans, they generally offer access to medical provider networks, although out-of-network providers may cost you more. But with major medical health plans, your insurance company handles all of your billing. 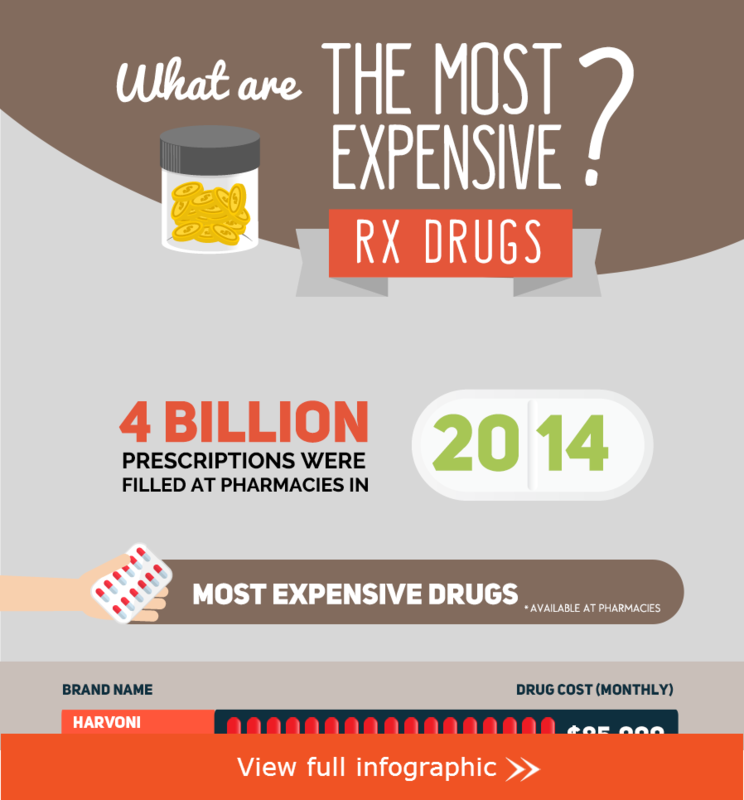 And, the company and your healthcare provider may even be able to lower the prices you pay. 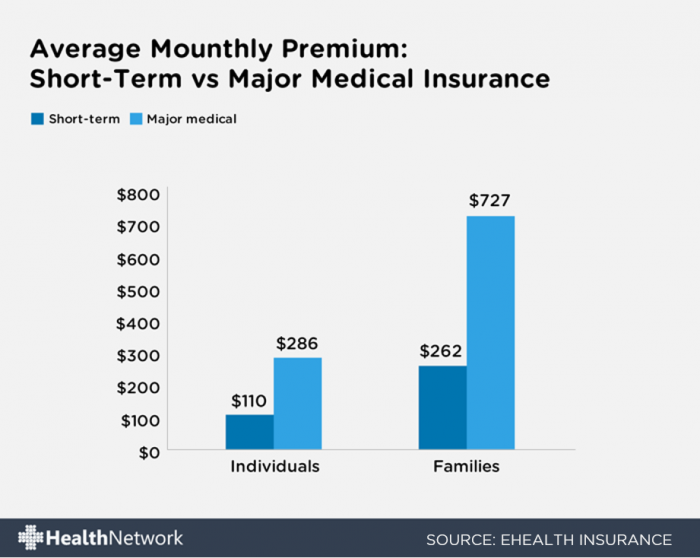 As a traditional, major medical plan has greater monthly premiums; many people prefer purchasing short-term plans. But there’s a reason that major medical plans cost more — they offer more benefits. Under the healthcare law’s established guidelines, the “metal plans” — bronze, silver, gold and platinum — must cover an average of at least 60 percent of covered medical costs. These plans must also cap out-of-pocket expenses, the amount you pay for covered care. In 2014, these were $6,350 for individual plans and $12,700 for family plans. In addition, these plans can’t cap the dollar amount of your annual or lifetime benefits. When it comes to short-term plans, the costs (deductibles, copayments) can vary widely. According to a study conducted by HealthPocket, a Sunnyvale, Calif., company that ranks and compares health plans, for a 30-year-old Los Angeles man, a six-month, $5,000-deductible short-term plan would cost as little as $99 a month. Meanwhile, the least-expensive “bronze” plan, one with a $5,000 deductible, purchased through California’s state-run exchange would cost the same man $175 per month. Unlike ACA-compliant plans, short-term plans don’t have dollar limits on their coverage. With a traditional plan, once you’ve reached your deductible, your insurance company will pay toward a treatment. All ACA-compliant plans sold on and off the Marketplace, as well as Medicaid and Medicare, offer at least ten essential benefits, regardless of costs, and no dollar limit applies. With a traditional ACA plan, if you earn less than 400 percent of the federal poverty level (about $46,000 for a single person), you may qualify for a monthly government subsidy. Government research shows that 87 percent of those enrolling through the Healthcare.gov website received subsidies to help offset their premium costs. But no subsidies are available for short-term health plans. ACA plans can also be purchased through government exchange, while short-term plans are sold directly by insurance companies or through brokers or websites. Or, 2 percent of your household income above the tax return filing threshold for your filing status, whichever is greater. The maximum penalty is equal to the national average premium for a bronze-level ACA health insurance plan. And, you’ll pay one-twelfth of the total fee for each full month in which a family member went without coverage or an exemption. When it comes to short-term plans, don’t think coverage is a given. Even if you’ve been approved for short-term coverage in the past, you’ll need to apply every time you renew coverage. Most companies selling short-term plans limit your coverage to six months at a time. They’ll often limit how many times you can repurchase coverage in a row, as well. Your medical history may cause you to be declined. For example, pre-existing conditions are not covered by short-term plans. And unlike an ACA-compliant plan, your coverage will be dropped or you’ll be denied payment if you try to receive treatment for a medical condition you didn’t disclose when you purchased your insurance. In addition, if you become sick and need to reapply for coverage under a new short-term plan, you could be turned down. Another issue is switching from a short-term to a major medical insurance plan. If you want to purchase, or you qualify for a traditional plan, you’ll have to wait for the next open enrollment period. This means you may be subject to gaps in coverage. 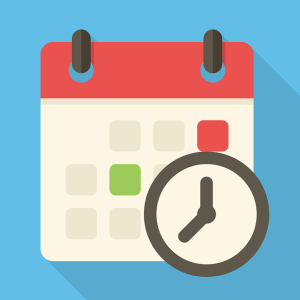 If you have a short-term plan, you should know that once your plan expires, you’re not eligible for Consolidated Omnibus Budget Reconciliation Act (COBRA) healthcare payments. And, purchasing a short-term plan also means that you won’t qualify for a Health Insurance Portability and Accountability Act (HIPAA) plan, which provides guaranteed issue individual health coverage. 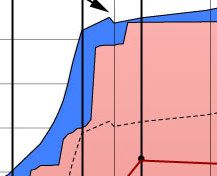 If you’re 30 or younger, you may want to consider purchasing a “catastrophic” plan. These plans, which are much less expensive than the ACA’s “metal” plans, meet the minimum essential coverage guidelines. You can also purchase a catastrophic plan if your life situation prevents you from getting health insurance; this is known as a “hardship exemption.” Basically, they’re a defense against worst-case scenarios, like illnesses or serious accidents. Catastrophic plans typically pay all medical costs, up to the deductible. Once you reach the deductible, the catastrophic plan usually pays essential health benefit costs. Under the ACA, catastrophic plans cover three primary care visits per year at no cost, even before you’ve met your deductible. In addition, they cover free preventive services. While these plans have lower monthly premiums, you may have to use their services more often costs are covered. 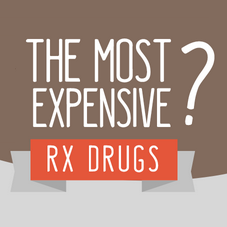 Plus, they have very high out-of-pocket costs. And, your income is not a factor when purchasing a catastrophic plan; you still pay the standard price. Buying one of these plans through the Marketplace also prevents you from receiving premium tax credits. Once you fill out your Marketplace application, your eligibility notice tells you what programs and savings you’re eligible for. If you qualify for a catastrophic plan, you’ll see these plans listed when you compare your coverage options. One of the key provisions of the Affordable Care Act was the expansion of Medicaid to more low-income families throughout the country. Right now, families who earn up to 138 percent of the federal poverty line in states that opted to expand Medicaid can enroll in the program. This year, the federal poverty limit for a family of three is $20,090, which means that that same family can earn up to $27,724.20 and still qualify for Medicaid under the new guidelines. By signing up for the program, they gain access to a host of benefits and features that they weren’t able to enjoy before. According to a report issued by the White House Council of Economic Advisers, Medicaid expansion also saves the country a lot of money. Having access to medical care greatly reduces long-term costs not only for individuals and families but for the country as a whole. The government report on Medicaid expansion points out that people who sign up for the program will see less catastrophic out-of-pocket costs, which are defined as costs that exceed 30 percent of a family’s annual income. In fact, Medicaid enrollees are 4.5 percent less likely to have to deal with these costs than they would be if they had no insurance. More important, millions of people now have the ability to pay their medical bills without taking out a loan or applying for credit thanks to Medicaid expansion. One of the top financial issues in the country is unpaid medical bills, which often lead to bankruptcy. By giving people access to better preventive healthcare, Medicaid expansion helps reduce the impact of unpaid medical bills. Preventive care is the best way to nip problems in the bud, and Medicaid allows people to receive more preventive diagnostic services such as mammograms, pap smears and cholesterol checks. 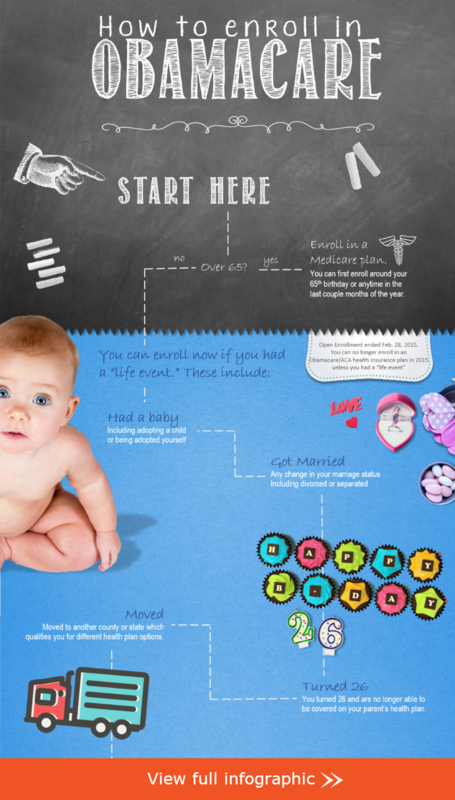 These services help doctors treat issues early, which can effectively reduce the chance for long-term problems to develop. In other words, when people can take care of themselves by getting proper preventive care, they stand a better chance of paying less overall for healthcare. The long-term advantage is lower healthcare costs for all Americans. The ACA allows states to opt out of expansion, and so far, about 22 states have chosen to keep their existing programs in place. Largely headed by Republican governments, the states that declined expansion are missing out on some of the advantages of increased Medicaid enrollment. Some low-income residents of these states are stuck in limbo when it comes to buying health insurance. They can’t afford to buy coverage, but they don’t qualify for federal assistance. In the 28 states that have expanded Medicaid, along with those in the District of Columbia, millions of new low-income families have joined the ranks of the insured. According to the Centers for Medicare & Medicaid Services, about 12.2 million people have signed up for the Medicaid and Children’s Health Insurance Programs since October 2013. The CMS keeps tabs on enrollment numbers and breaks down the figures month by month in routine reports. It’s not clear how many states will jump on board the Medicaid expansion bandwagon over the next five years as the ACA continues to implement its provisions across the country. Montana has already submitted a proposal to expand its program while several states continue to debate the issue. Despite many states’ unwillingness to expand Medicaid, estimates indicate that expansion would benefit millions of additional low-income families. In Utah, for example, the cost of uncompensated care would drop by $70 million if the state were to expand Medicaid. By not expanding the program, Utah is giving up about $240 million in federal funding. The federal government is offering 100 percent support for Medicaid costs through 2016. Each year after, federal cost assistance drops slightly until 2020. At that point, the government will offer 90 percent funding, which still represents a significant portion of the program’s benefits and features. If states take advantage of the expansion, they could notice improved economies and healthier populations. The Tax Subsidy is financial support offered on behalf of the federal government to individuals and businesses, with the goal of making healthcare more affordable. The Obamacare Tax Subsidy provides federal tax credits to offset healthcare cost. These tax credits are usually awarded to individuals and small businesses that fall within a certain income bracket. It provides an option to obtaining affordable healthcare, by reducing the cost of monthly healthcare premiums. The premium tax credit is a refundable tax credit that can be advanced in whole or in a part and that was designed to help individuals and families with the cost of health insurance. For individuals who are eligible to receive health insurance through their state’s or the federal health insurance marketplace, those individuals are probably eligible for the Premium Tax Credit (PTC). The Marketplace offers a variety of health insurance options. 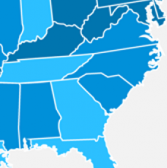 The 2016 Health Insurance Rates will vary by geographic location. 4) The individual can not be married and filing a separate federal tax return, unless the individual is a victim of domestic violence and have met the requirements in Notice 2014-23. 5) The individual cannot be claimed as a dependent on someone else’s tax return. In order to qualify for the premium tax credit, you must purchase your health insurance through the Health Insurance Marketplace. You can either apply for health insurance through your state’s or the federal health insurance marketplace on your own or you may enlist the help of a licensed insurance agent or broker who can help you fill out the application, review your options, understand the subsidies available to you and what that will mean for your wallet and enroll in health insurance as well. 2) Get It Later. You can pay the full amount of the premiums every month and receive a credit at the end of the year when filing your tax return. During open enrollment, the Health Insurance Exchange will provide you with an estimated amount of your premium tax credit in which you will be able to claim when filing your annual tax returns. It is also important to notify the Health Insurance Exchange of changes in income throughout the year, for receiving too little or too much can affect your refund balance when filing your tax return at the end of the year. Individuals and families who generally fall within 100 percent and 400 percent of the federal poverty line are eligible to receive the premium tax credit. For individuals who either live in state that expanded the Medicaid requirements and make under 133% of the Federal Poverty Level or live in a state that did not expand the requirements and make under 100% of the Federal Poverty Level, you must enroll in Medicaid and are unfortunately not eligible for a premium tax credit. If your income increases and you become eligible for a subsidy and ineligible for Medicaid, you have triggered a Qualifying Life Event that allows you to enroll in health insurance on the state or federal insurance marketplace during a Special Enrollment Period. During this time, even if it is after the open enrollment period, you can get a federal subsidy to help you pay for your healthcare costs. Federal poverty guidelines change annually due to inflation and are calculated by the US.. Department of Health and Human Services. When calculating the premium tax credit, eligibility is based on poverty levels using the most current published poverty guidelines during open enrollment. For example, 2014 tax credits will be based on 2013 guidelines. The 2014 guidelines will be applied to 2015 Health Insurance Rates. For any tax year that you receive an advance credit and payments, you are required to file a federal income tax return for that year. If you have chosen to receive your tax credit in advance, you will subtract the advance payments that were received during the year from the amount of the premium tax credit calculated when completing your tax return. If the advance credit exceeds the premium tax credit, the difference may result in a balance due or a decrease in your refund. If you have chosen to receive the credit when filing your annual tax return, it will either increase your refund or decrease any monies due. Businesses with less than 25 full-time employees might be eligible for the Small Business Health Care Tax Credit. Small business owners were eligible for a maximum tax credit of 35% of premiums paid for 2010 through 2013 tax years. Beginning in 2014, there will be changes to the credit. The maximum credit will increase to 50% for employers and 35% for tax-exempt employers. An increase in 2015 Obamacare Rates may not be noticeable to small business owners due to an increase in tax credit. To be eligible for a credit in the 2015 Obamacare Rates, the small employer must pay premiums to a qualified health plan through the Small Business Health Options Program (SHOP) or qualify for an exemption. The credit is offered to eligible employers for two consecutive years. Small business owners will claim the credit by filing form 8941. Original article (5/20): According to ACASignups.com, more than 12 million people purchased a qualified health plan (QHP) through an ACA exchange. QHPs are ACA-certified insurance plans approved by the Health Insurance Marketplace. They must provide essential health benefits, follow established limits on cost-sharing (i.e., deductibles, copayments and out-of-pocket maximum amounts) and meet all other requirements. Additionally, QHPs are certified in each Marketplace in which it is sold. Of these 12 million reported, more than 9 million beneficiaries were found to have obtained their policies through HealthCare.Gov, the government’s official website for healthcare coverage. But the 12-million mark may be too low, as it doesn’t factor in normal off-season enrollments, such as life changes, occurring in nearly every state since Feb. 22. 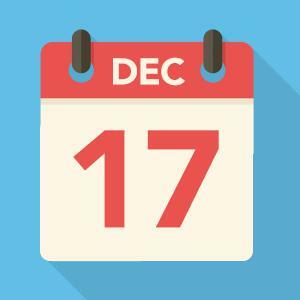 Plus, as of this date, six state-based exchanges have not yet reported the figures for enrollments made during the tax season special enrollment period (SEP). Therefore, it’s predicted that the eventual exchange-based QHP enrollment figures could be as high as 13.7 million by the end of November, 2015. During the government-approved six-week extended enrollment period – running from March 15 to April 30 — about 147,000 people signed up in the 36 federal exchanges, while another 100,000 or so enrolled in other states. Overall, this year’s open enrollment period was considered a huge success, both for the millions of newly covered Americans and the Democratic Party. The Republicans have claimed that the OEP’s high numbers were actually due to the Medicaid expansion. However, these results show that these 12 million are actually private plans purchased from ACA exchanges. Several Republican-controlled states that refused to establish exchanges — including Florida, Arkansas, Maine, Georgia, Michigan and North Carolina – have used federal funds for their eligible residents’ healthcare coverage. However, the nation is currently waiting for the Supreme Court’s decision on state-run exchanges (King v. Burwell). At the heart of this case is the issue of states’ exchanges eligibility for subsidies; without these, millions nationwide will be unable to afford their coverage. According to a Robert Wood Johnson Foundation study, if the Court rules against the Obama administration, about 6.3 million people could lose coverage. Of this number, 82 percent have modest incomes, but are not poor, 62 percent live in the South and 61 percent are white. These are important populations for the Republicans, and the party could face a big backlash. Americans are urged to enroll before the court’s decision in June to ensure they can take advantage of free government subsidies in case the decision no longer allows them.